The community of Kikamulo gathered at of Kikamulo Sub County near Kikamulo Health centre III after mobilization by Bagundede groups of persons Living with HIV/AIDS (PHA). This gathering brought together local leaders, the sub county chief, religious leaders, Village health team members, health workers, community decision makers and the community development officer. Members of Bagundese PHA declared that their group was not a political party and therefore welcomed all members, especially those living positively with HIV. “We are happy that Bagundese compliments government of Uganda efforts to develop and enable PHAs live a productive life. We as leaders are going to spread the news about this PHA group and would like to ensure that our community realise the benefits of development initiatives proposed by this group including the rights of persons living with HIV”. Hassan Mutebi the District Coordinator of PHA groups for Nakaseke District urged leaders in all the sectors to come aboard and accept the plight of PHAs. Hassan also called community leaders to let people know that Bagundese has placed at least 2 people in every health centre III. He said the reason why they placed PHAs at health centres was to enable persons who test positive to have people to approach at those facilities without fear. We do not want people who test positive to shy away and run from the medications and later ARVs. We are there to help them. Nakaseke HIV prevalence rate is at 8%, higher than the national prevalence of 6.5%. As a district Nakaseke is number 6 among the places with a high prevalence. “Why are we on top? How are those that are not having a high prevalence rate managing to keep it low and do better? And as leaders, how do we mobilise others?” Asked Hassan Mutebi. According to Kasenene Tom, acting as the chairman of Bagundese, the group started in 2002 as an HIV testing group among people in Nakaseke, Kikamulo and Kassangombe. “We were then concerned about our health after testing HIV positive. We realised that with HIV it was not the end of life as long as you are living positively with HIV. I am also among the people who almost died of HIV. But I got the courage to get tested and ever since I was diagnosed with HIV and started on ARVs, I am very ok”. “We are here to educate. 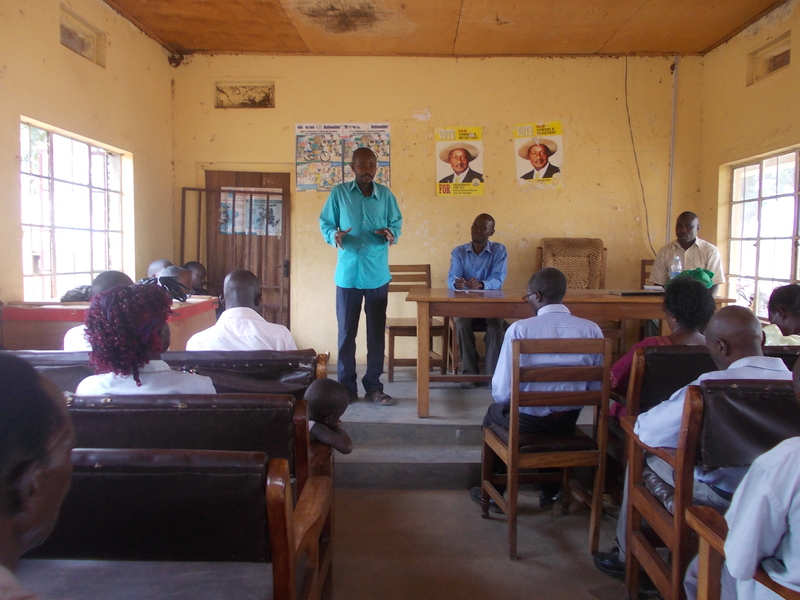 We invited you leaders of Kikamulo to tell you that support us in our efforts to reduce infection and re-infection. We are asking you including religious leaders to support us because HIV is in churches, mosques and public gatherings. We also ask you to give us your suggestions on how to stop the spread of HIV. The sub county chief, Jjingo Ali thanked people from Bagundese PHA for demonstrating such heroism to self-disclose their status about HIV. “I urge you all to embrace the activities of PHAs. Stop accusations and counter accusations in homes. And stop domestic violence and always blaming each other about HIV”.